La Venue held an anniversary party on June 2nd, located at Terminal Stores, between 27th and 28th streets. With the space just being open on year, La Venue has held many beauty, fashion and fine dining events, including The Train tradeshow, Shecky’s Beauty and Girls Night Out and the NYC Wine and Food Festival. Creative Edge Parties had a very inventive setup of desserts and dessert drinks in one of the back rooms. 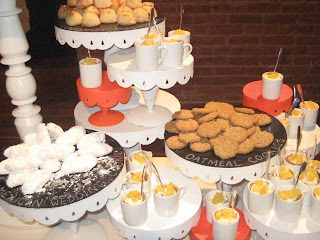 The desserts were very simple, including oatmeal and Mexican wedding cookies but had a fun, inviting display. 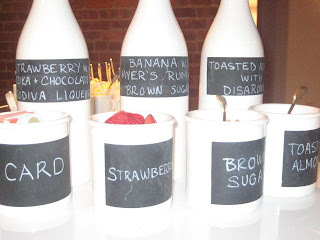 The dessert drink menu was displayed on old school milk bottles, and choices of strawberry vodka + chocolate Godiva liquer, banana Myers rum + brown sugar and toasted almond with Disaronno were written in chalk. If you aren’t familiar with Creative Edge Parties, you should definitely check out their website at www.creativeedgeparties.com and click on ‘A TASTE’ to view some of their exquisite hors d’oeuvres. I only caught the tail end of the party but Allure Catering was also on deck with hors d’oeuvres. Domaine de Canton prepared the drinks, with a special Domaine de Canton drink that included fresh lemon juice, angostura bitters and club soda. Domaine de Canton is a French Ginger Liqueur, a sweet and flavorful blend of French cognac and fresh baby ginger.